Want to learn how to fish? Fishing is easy! All you need is a fishing pole, hook, and food for the fish (called "bait"). The bait can be worms, bugs, or even bread balls. You need to bring the food the fish like to eat. If you are not sure, ask your parents what the fish will bite. On a sunny day, don't forget to bring a hat and sunscreen. You may also want to bring a snack in case you get hungry. Put the bait on the hook and carefully lower your hook into the water. 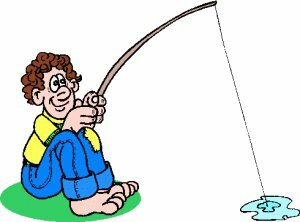 If you feel something pulling on your fishing line, give your pole a short tug to hook the fish. Then turn the handle on your fishing pole to bring the fish out of the water. If you don't catch a fish after waiting for a long time, try putting your bait in a new place in the water. Sometimes you have to find the fish. Good luck! What are the three things you need to fish? What is the food for the fish called? On a sunny day what should you bring? What should you do if you are not catching a fish?